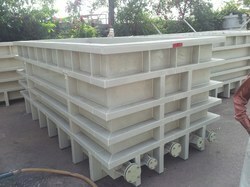 Product Description: Uni tanks are used for the purpose of storage in many industrial processes. They can hold residue liquids, end products and bulk produces also. We manufacture uni tanks that are made of stainless steel. They are highly sturdy and rugged and are capable of holding high temperature liquids. We are counted amongst the top companies involved in offering a wide range of Storage Tanks. These are highly reckoned among our clients because these have smooth finishing and have accurate dimensions. These have high tensile strength and are used in different industries for storage of gases as well as liquids also. We are the leading organization actively occupied in providing an extensive series of HDPE Tank. This product is presented in numerous of specifications. We have in store for our clients, an industrially apt range of Radiation Tanks that is used for maintaining the strength of the radiation in pharmaceutical industries. These radiation tanks are available in different capacities and are appreciated by our clients for their high performance, durability and reliability. We are one of the well-distinguished companies in the market that are into providing Agriculture Blower Tank. We are indulged in offering the finest quality Polypropylene Tank. We Offer you a complete choice of services which include Storage Tank Fabrication, MS Storage Tank Fabrication and SS Storage Tank Fabrication. Bajrang Engineering & Process Equipments Co. Storage tanks developed using high quality MS and SS material. Our tanks are widely used in various industrial and commercial applications for the purpose of storing liquids and gases. Widely appreciated for its features of corrosion resistance, high strength, and robust construction, the product can be customized as per the client’s specifications. in dairy farming a milk silos is a large storage tank for cooling and holding milk at a cold temperature until it can be picked up by a milk hauler.